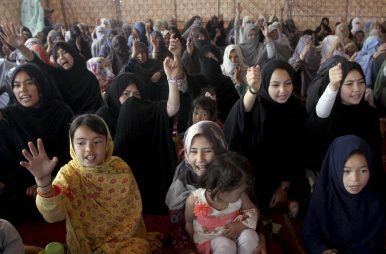 Pakistani Shiite families from Hazara community chant slogans during a sit-in protest to condemn Friday's suicide bombing, in Quetta, Pakistan, April 13, 2019. More than 2,000 Hazaras have been killed since 2004, with the latest deadly attack on April 12. Pakistan’s Hazara community had peace for roughly one year before terror broke out again. On Friday, 55 Hazara vegetable vendors said a routine goodbye to their loved ones, not realizing the danger that would come next. Minutes after arriving at Hazarganji market, a bomb detonated among burlap sacks of potatoes, taking at least 16 lives – and any hopes of returning back to their loved ones. The blast turned the blue sky grey with bits of dust and potatoes floating in the air. For Pakistan’s nearly 1 million Hazaras, the incident also carried the eerie sense of lurid déjà vu. Sadly, it is neither the start nor the end of the bloodshed in their ghettoish enclave of Quetta, Balochistan. While hundreds of Hazaras across Balochistan’s coastal belt have been forced to flee to southern cities of Pakistan, reportedly 70,000 others have taken a precarious migration route to countries such as Australia in a bid of better and safer life. Despite the increased installation of Frontier Corps (FC) and checkpoints erected after 2013, Hazaras have continued to be targeted almost everywhere in Balochistan. Safety has yet to return to the city of “walking dead” and peace remains nothing but a dream. The Hazara community has tried all possible means to make their demands for justice, protection, and security heard: from sit-ins in the cold and heat to worldwide protests; from knocking on government doors to searing hunger strikes. Sad to say, however, none of these efforts have borne fruit – even the international community has turned blind eyes to their plight. In May 2018, Chief Justice Mian Saqib Nisar declared that Hazaras were effectively undergoing “ethnic cleansing” at the hands of extremist groups and called for serious actions. Later that year Pakistan’s chief of army staff, General Qamar Javed Bajwa, paid a personal visit to meet the leaders of the community, promising them protection and security. In practice, however, they have defaulted on those promises. That implies either incapability, indifference, or possible complicity with the extremists. Since Pakistan’s evolution as an independent state in 1947, the country’s leaders have played on religious sentiments as a means of strengthening national identity. That includes attempting to breed and manage militant Islamism and “trying to calibrate it so that it serves the state’s nation-building function,” as former Pakistani ambassador Husain Haqqani put it. General Zia-ul Haq’s “Islamization,” for example, gave rise to a devastating extremism that penetrated both the social and political fabric, resulting in religious intolerance, social hatred, and sectarianism, and a fragmented and polarized society. In the mid-1980s, its impact resonated and lingered in Balochistan’s homegrown radical-extremist groups, which view Hazara Shiites as “heretics.” One such example is the Sunni extremist group Sipah-e-Sahaba Pakistan (SSP), which begot a vicious offshoot known as Lashkar-e-Jangvi (LeJ). Though the SSP was banned in 2002 by the then-Musharraf government, it was subsequently re-established under the new title of Ahl-e Sunnat Wal Jama’at (ASWJ) later. [T]he effort to create national cohesion between Pakistan’s disparate ethnic and linguistic groups through religion assumed greater significance, and its manifestations became more militant. Religious groups, armed or unarmed, gradually became more powerful as a result of this alliance between the mosque and the military. Radical and violent manifestations of Islamic ideology, which sometimes appear to threaten Pakistan’s stability even today, can be seen in some ways as a state project gone awry. Although LeJ has been labelled by Pakistan’s Inter-Service Intelligence (ISI) as one of the country’s “most virulent terrorist organizations,” and proscribed by the United States, doubts remain about the severity of the crackdown on such groups. In one interview, SSP leaders proclaimed that Pakistani military and intelligence had advised them in 2016 “to tone down their inflammatory, anti-Shia language but maintain their basic policy.” In another example, LeJ leader Ramazan Mengal was freed by the authorities two days before the Friday attack despite Mengal’s admission of killing tens of Hazaras, and serious allegations of human rights violations. Likewise, groups like LeJ, which has its roots in Punjab, have continued to organize public and free-spoken anti-Shiite rallies, particularly against the Hazara community in Pakistan. A video from one such rally on Mezan Chowk in Quetta shows LeJ leaders freely chanting “Shiite Kafir” slogans, threatening to “wipe out the entire [Shiite] Hazara community,” while FC personnel and police are seen roaming around the rally. Under the aegis of some senior Baloch tribal leaders, especially of the Raisani and Mengal tribes, groups like LeJ have built several madrasa cells by enticing locals to join their Islamist-extremist militancy. It is said that LeJ madrasas have even stretched to southern Punjab in Mastung, the heart of the territory controlled by the Raisani tribe. Beyond the physical attacks, there are plentiful threats and hate slogans directed at the Hazara community; hateful slogans chalked on walls, death threats delivered on social media, and distribution of anti-Hazara printed leaflets across the province. For too long, Pakistan’s Hazara community has been facing systematic persecution in the form of mass attacks, targeted killings, intimidation, and egregious abuse – all because of their ethnicity and religion. While the perpetrators slaughter Hazaras with an air of confidence that defies the law, the international community excites their plight through their silence. Balochistan, the epicenter for these repeated massacres, has sustained various hate campaigns against the Hazara community, both the central government and the army have persistently failed to apprehend attackers or prosecute members of militant groups, including LeJ, that have claimed responsibility for numerous attacks against the Hazara community. Unless the Pakistani army and government take all necessarily concrete measures with courageous political reforms to stop that campaign of violence, it will, unfortunately, continue to take tolls on the Hazara community of Pakistan. *A previous version of this piece misstated the timeframe of the National Commission for Human Rights’ report. Maisam Iltaf is a Kabul-based researcher and human rights activist. He is the co-founder of Rahila Educational and Resources Center (RERC), and a contributor to Global Voices.